Bugs and sunburns can ruin any good camping trip. thankfully there are plenty of ways to protect yourself from the sun and pesky biting bugs like mosquitos and noseeums. If you are looking for a natural bug repellant and sun protection there are a number of herbal based potions and lotions, so you don't have to spray chemicals on your skin that might make you sick. One of the best ways to keep the bugs away so you can have a comfortable camping trip is to use natural products like a cactus juice based bug repellants. From Cactus Juice: "Many people use cactus juice products as a topical pain killer for sunburns, ant bites, bee stings, minor cuts and burns. All Cactus Juice products contain natural cactus extract. Therefore, they are all naturally anti-inflammatory and natural topical pain killers. Cactus Juice products don't have DEET! Therefore, they're safe for kids, safe for animals, safe for daily use, and safe for the reef." Here's our experience using the SPF20 Cactus Juice Sun and Skin Outdoor Protectant, which is a sunscreen and a blend of cactus extract, emollients, and moisturizers that protect against a broad-band of insects: mosquitos, no-see-ums, yellow flies, sand fleas, black flies, greenheads, deer flies, chiggers and ticks. 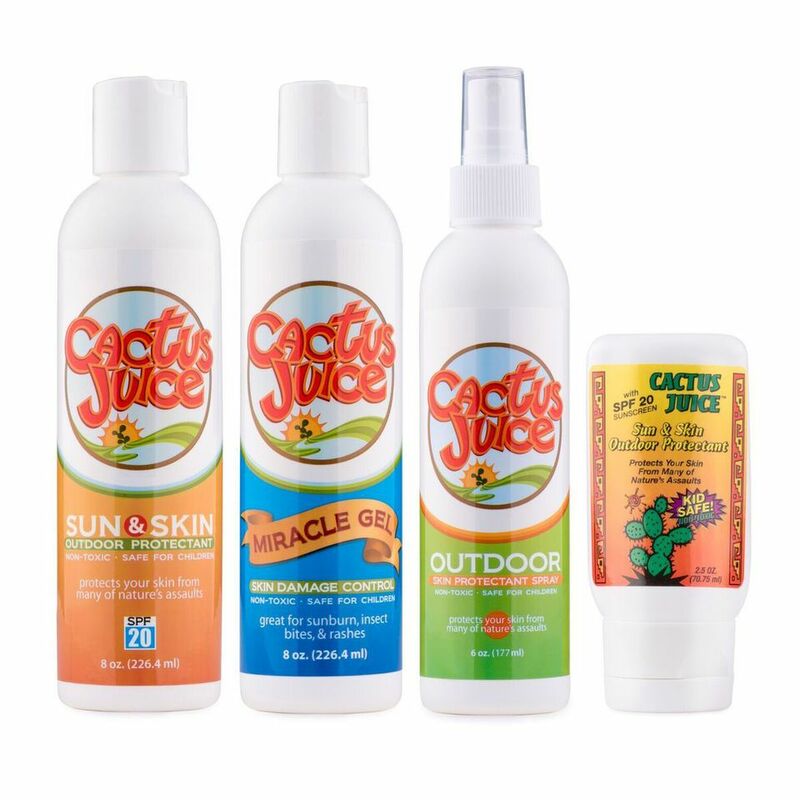 Cactus Juice Sun and Skin Outdoor Protectant repels mosquitos, gnats, flies, and noseeums. It comes with or without SPF 20 sunscreen, and it moistures dry chapped skin. Cactus Juice uses no DEET or other harmful chemicals, so it is safe for kids. It's made from a blend of prickly pear cactus extract, emollients, and moisturizers and comes in 8 oz. and 2.5 oz. bottles. I was surf fishing on the Outer Banks of NC in September four years ago. The wind was blowing the wrong way, and the green flies were horrendous. Since I was the only obstacle between them and death by drowning, I soon became their refuge. Green flies have a mean bite, and they leave a nasty sore. I'm a determined fisherman, but this day the green flies were winning. Down the beach was a lonely fisherman, and from the looks of it, the flies weren't bothering him. We asked him why, and he said he was using Cactus Juice, some new stuff that just came in at the tackle shop. He let us try some and sure enough, the flies were leaving us alone and so were the mosquitoes. Cactus Juice really worked. Cactus Juice is now sold with new labeling, but the formula is the same as the original I tried. Cactus Juice deserves a place in every tackle box. Do not wear overly scented lotions and perfumes. You'll only be attracting the bugs to yourself. Wear long sleeves and pants to protect your skin. Bugs love stagnant water. Camp away from moist areas like grass and ponds. Keep your camping area clean of food smells. Start a campfire or use mosquito coils at heavy bug hours like dusk and dawn. Want to avoid Zika or similar viruses? These products can help!